Outdoor kitchens are a sizzling hot trend in outdoor living. Studies continue to show that outdoor kitchens remain the most requested outdoor feature of a home in Reading and Lancaster, PA, and beyond. 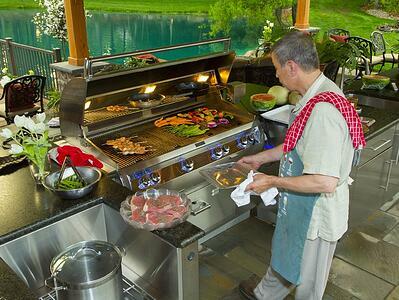 But, resale value aside, an outdoor kitchen is a destination location for you and your family to enjoy. 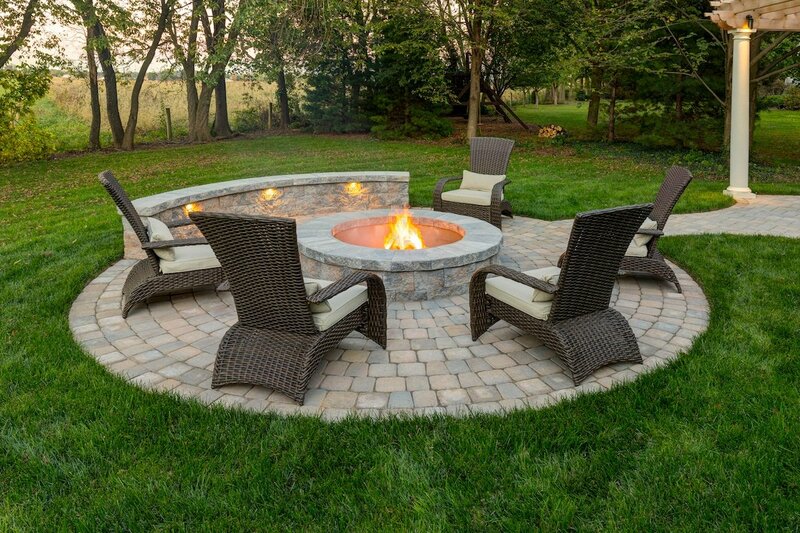 It is a space that will help you truly capture the full potential of your outdoor living area. After all, there’s nothing quite like cooking and dining al fresco and an outdoor kitchen allows you to do just that. You’ll be able to entertain and enjoy time with friends and family in a unique way. Finding a company that knows what it takes to put together a complex building project like an outdoor kitchen is incredibly important. Outdoor kitchens have become a hot trend nationwide, but there aren’t a lot of companies in the Reading or Lancaster, PA areas that are considered to be expert outdoor kitchen builders. In fact, many companies might only do one or two of these projects per year. 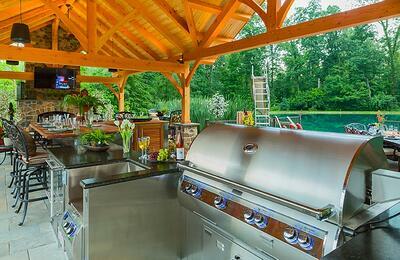 At Earth Turf & Wood, 50% of the outdoor living projects we take on, include an outdoor kitchen design. It’s a project that we not only love to do for our clients but have a lot of experience doing. There is no one-size-fits-all approach to an outdoor kitchen. It can be as simple or as high-end as your style and your budget allows. A basic outdoor kitchen design will start with the key necessities, such as a grill built into a countertop and a simple storage unit. The counter overhang can provide some bar seating next to the chef. A basic outdoor kitchen starts at $15,000. From there, the add-ons and the budget can run the gamut. Naturally, the more features you add, the more it will cost. It’s also important to remember that outdoor kitchen appliances and materials can range dramatically in price, just as they do for indoor kitchens. Some of the most popular add-ons for outdoor kitchens include a built-in refrigerator, a pull-out trash container, lighting, and a sink with running water. But an outdoor kitchen can include anything that your indoor kitchen has. The highest end, dream kitchens can feature pavilions, fireplaces, audio/visual capabilities, and other customized features that suit your exact wants and needs. Just as your Reading or Lancaster, PA outdoor kitchen can be as small or large as you wish, it can also have any look that you desire. 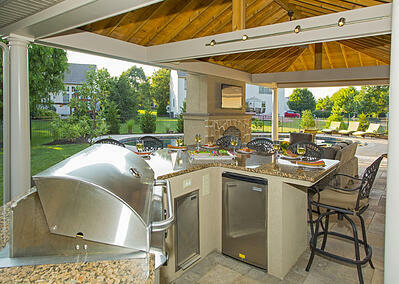 Oftentimes, an outdoor kitchen is designed with your home’s interior in mind. Since an outdoor kitchen is typically viewable from the family room, it’s nice to tie the looks together so that it is unified with its surroundings. 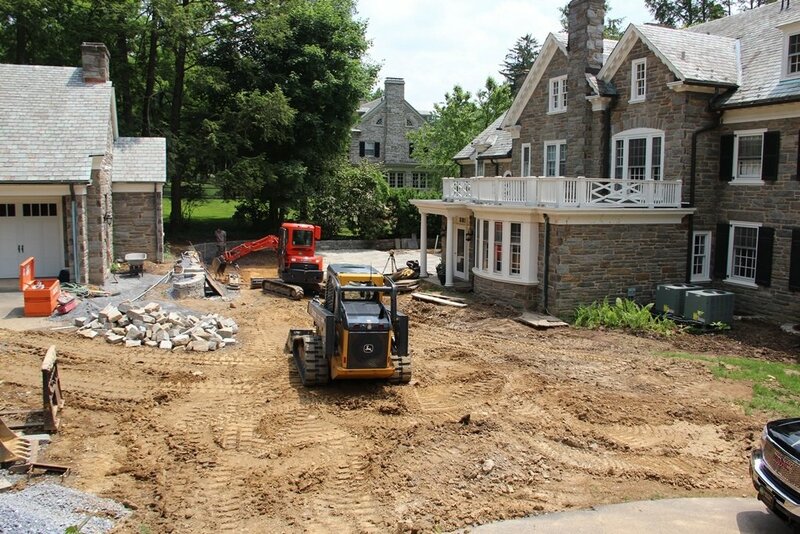 A beautiful stone fireplace in the family room, for example, might be replicated as part of the outdoor kitchen. 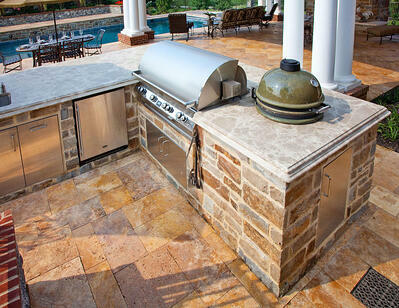 An outdoor kitchen design can also take on various shapes such as U-shaped, galley, or L-shaped. Each of this is not only a very different look but also has a different functionality in terms of moving around and in and out of the space. 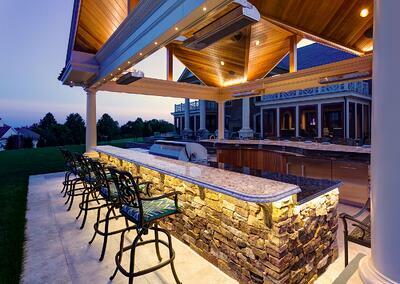 Materials are also an important consideration with your outdoor kitchen design. Granite is far-and-away the most popular countertop choice given its durability and appeal. But color must be given some thought. Though black is a popular choice, if your outdoor kitchen is in the sun, a black countertop will get very hot. An earth tone or even a white granite or other natural stone countertop might be a better choice. In addition, outdoor cabinetry comes in a variety of materials ranging from waterproof polymer materials to bamboo, teak, or reclaimed lumber. But perhaps most popular of all is stainless steel both for its classic kitchen look as well as its durability in the elements. The appliances truly make the outdoor kitchen functional and complete. 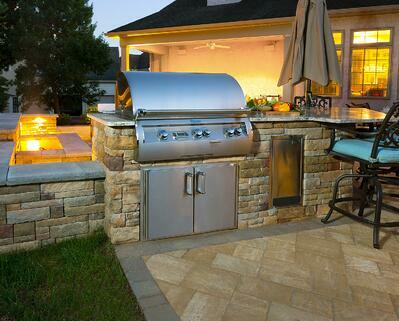 At the very least, an outdoor kitchen will have a built-in grill. Of course, there are many choices in grills and cost can vary dramatically based on its size and features. Some homeowners are requesting an outdoor kitchen side burner, separate from the grill. This might be used in conjunction with the grill such as boiling a side dish, or it might be used entirely on its own. It can come in handy even on nights you’re not grilling. Instead of cooking a seafood dish indoors where the smell can linger, it can be cooked outside. 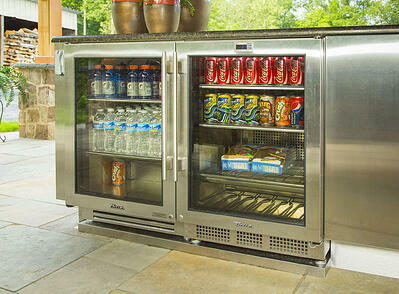 Outdoor kitchen appliances may also include a refrigerator, dishwasher, oven, beer kegerator, or an ice maker. Any appliance that you have in your indoor kitchen can be part of your outdoor kitchen. But that’s not to say you should use appliances made-for-the-indoors in your outdoor kitchen. That’s because outdoor appliances are specially built to be more durable in order to deal better with temperature fluctuations and be able to withstand the elements. While that can make them a bit more costly, it’s not an area where you should cut corners. If you’re going to invest in an outdoor kitchen, you want to make sure that it’s done right. Even the smallest outdoor kitchens should be designed in a way that you will get the maximum use and enjoyment. In order to achieve that, it’s incredibly beneficial to choose a company that has a Registered Landscape Architect on staff. There are so many details that come into play that seem small but can tremendously impact the functionality of your outdoor kitchen. For instance, imagine you might be carrying a tray of food from the indoor kitchen to the outdoor one. What outdoor kitchen design will work best for you spatially so that you can seamlessly walk from one space to the next? Where will your young kids be playing while you cook so that you can ensure you have eyes on them at all times? Will you be mostly cooking for your family or do you frequently entertain guests? These are just a few of the dozens of questions a Registered Landscape Architect would ask in the design phase that others could easily overlook. It’s important that even the smallest details are accounted for in the design. At Earth, Turf, & Wood, outdoor kitchens are frequent projects for us, but that’s not to say that every project isn’t unique. In all of our years of completing outdoor kitchens, no two projects have ever been identical. We don’t do cookie cutter, but we do have the experience and the know-how to get you the most value for your investment. 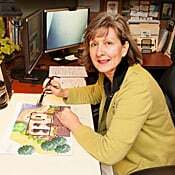 With a Registered Landscape Architect on staff, we do take every single detail into account with our designs. And with a team of meticulous craftsmen, you can be sure that the same level of detail will go into your outdoor kitchen construction. We know that an outdoor kitchen is an investment and want you to truly fall in love with the finished project just as our other clients have. We have a portfolio full of outdoor kitchen ideas that we have brought to life for our clients over the years and look forward to working on yours next. 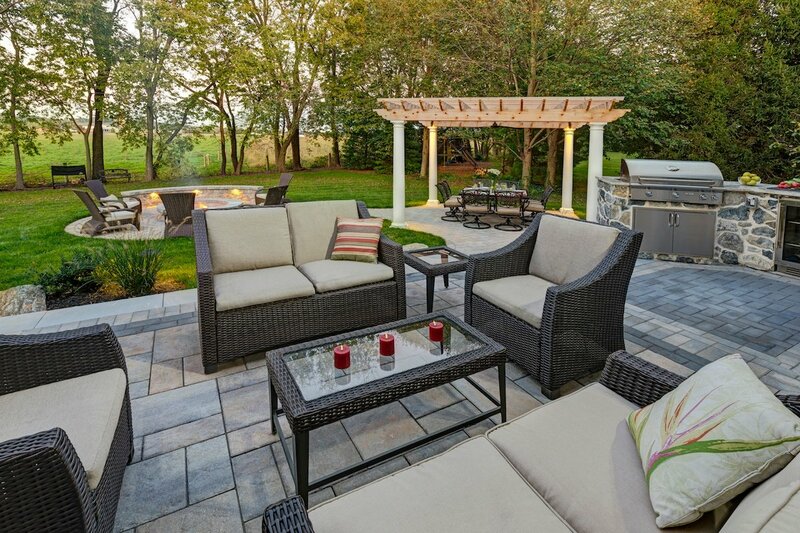 Want to see some of those outdoor kitchen ideas for your Reading, Harrisburg, York, or Lancaster, PA home? Check out our idea gallery. 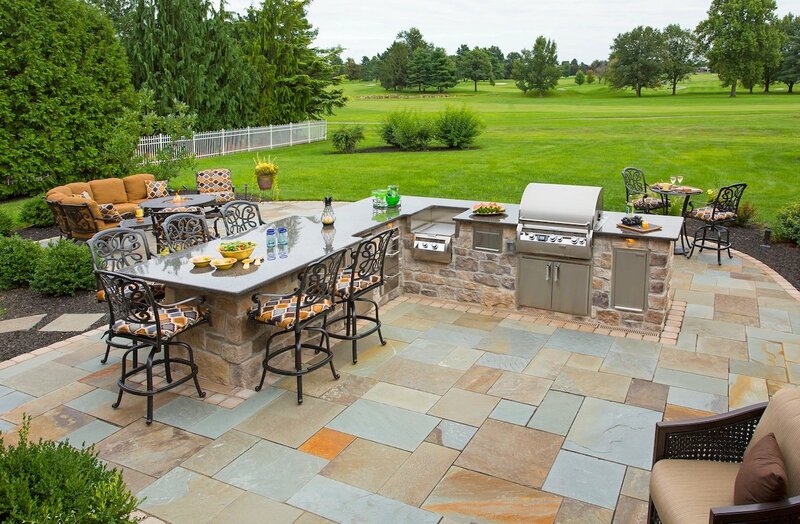 Or get in touch with us at (717) 276-9447 to start the conversation on bringing your outdoor kitchen dreams to life with a free consultation.